Excellent crew today, shout out to SD Kathleen and her team. 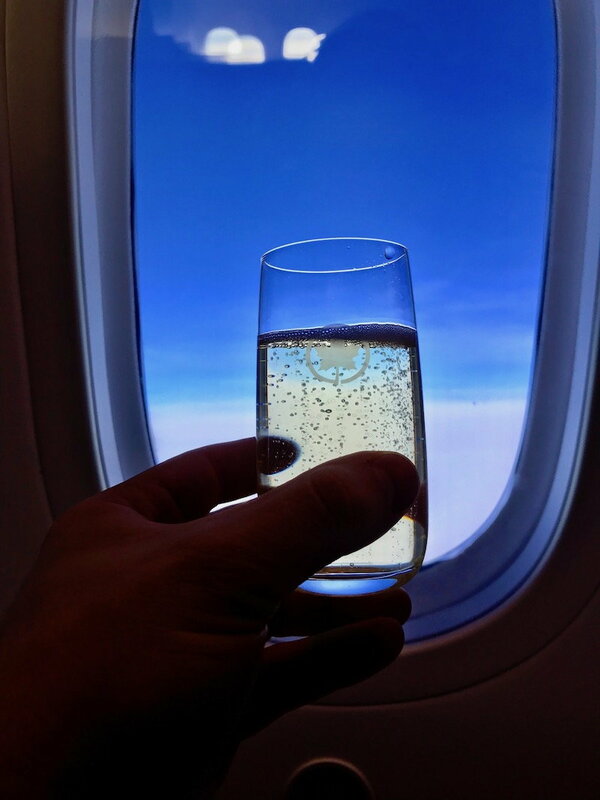 Champagne tastes so much better when it's properly chilled, and served in a flute. 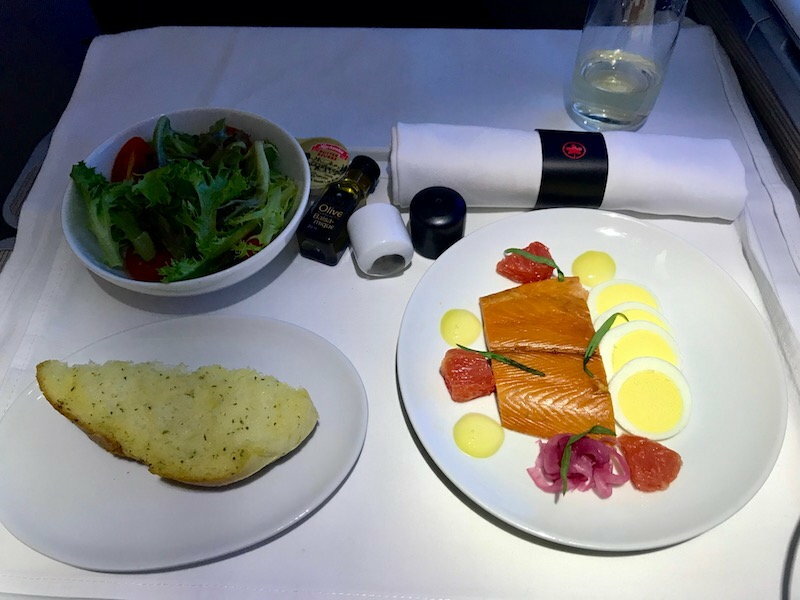 The Smoked trout, grapefruit, pickled onion, egg, lemon emulsion was exactly the same as my YVR-CDG flight a month or so ago. I ate everything except the grapefruit which I'm still not sure works well with the rest of dish. The garlic bread was excellent and it seems AC is slowly finding it's balance there. The challenge still is keeping the slices warm when they reach the last row, and I think there is room for improvement there, but it's a really minor quip. I also think AC could be a bit more inventive with the side salad, and dressing. It has been the exact same salad for as long as I can recall, except when they added (and then removed) the parmesan shavings. For my main, I tried the Lime and chili salmon, cauliflower quinoa, green beans, shiitake mushroom. The fish was moist and flavourful and not overly salty, and the dish was not too heavy which I always appreciate. Cheese course of Oka, Brie, medium Cheddar, crackers, along with a glass of Port. 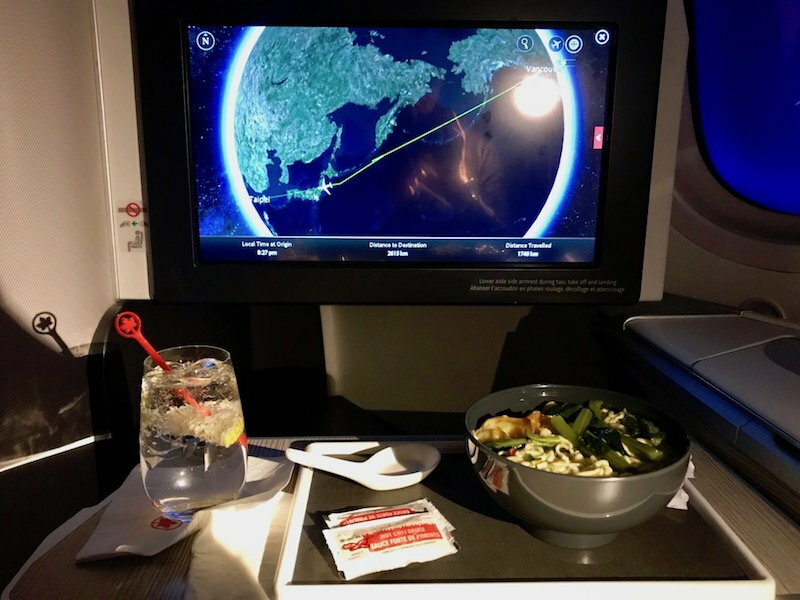 Over Japan, it's noodle time! As always, Hot noodle soup, shrimp and pork wontons, gai-lan hit the spot, especially with a generous helping of the spicy sauce. I did not partake in the pre arrival meal. Does anyone have the menu for AC2 from November or December (or recent past)? Air Canada website does not have a menu for AC2. 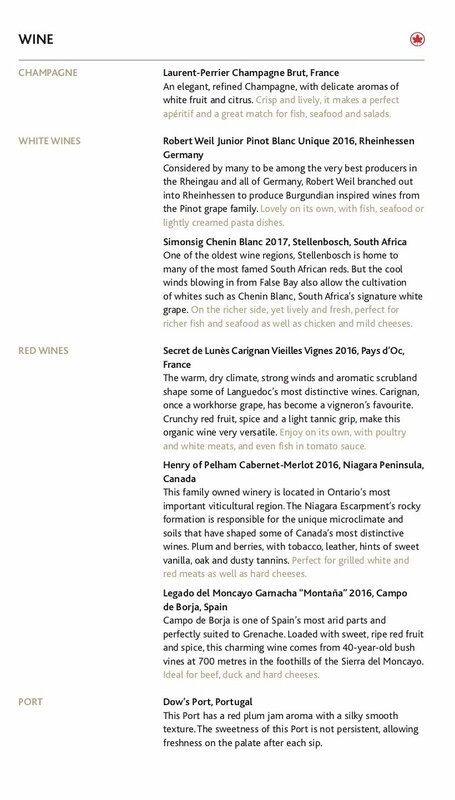 I could find NRT - YVR/YYC (https://www.aircanada.com/content/da..._YVR%20YYC.pdf) menu, but that doesn't seem to be the menu for HND-YYZ. 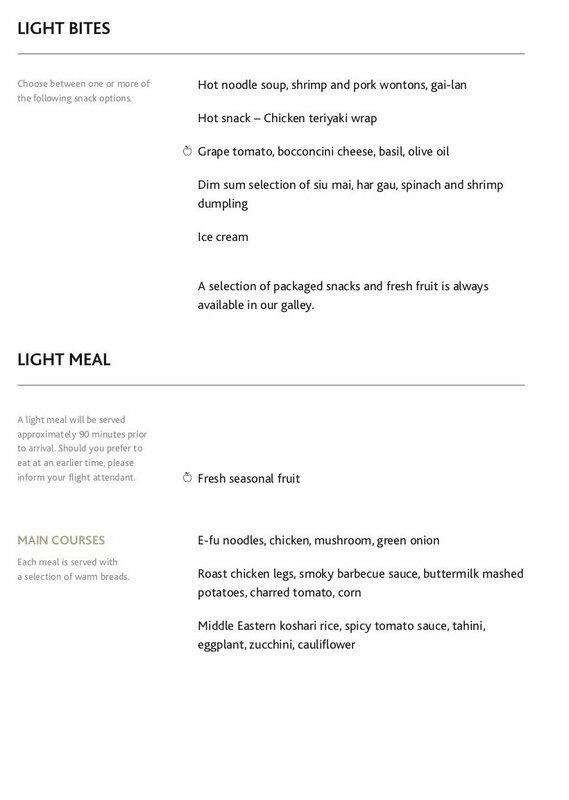 I would guess they'd have hot light bites options for AC2 as the flight is longer and the other parts would be very similar. Can anyone confirm? Thanks! Yes, AC 1/2 has the At Your Leisure / a la carte section. I just came here to ask this, so thank you. I wish AC would start putting the menus back on the website; I have not been able to pull one up for any of my routes for a long time. The menus are back and a few of us posted them just above. However, I also pointed out that they are NOT there for all routes and in some cases, they are shared e.g. 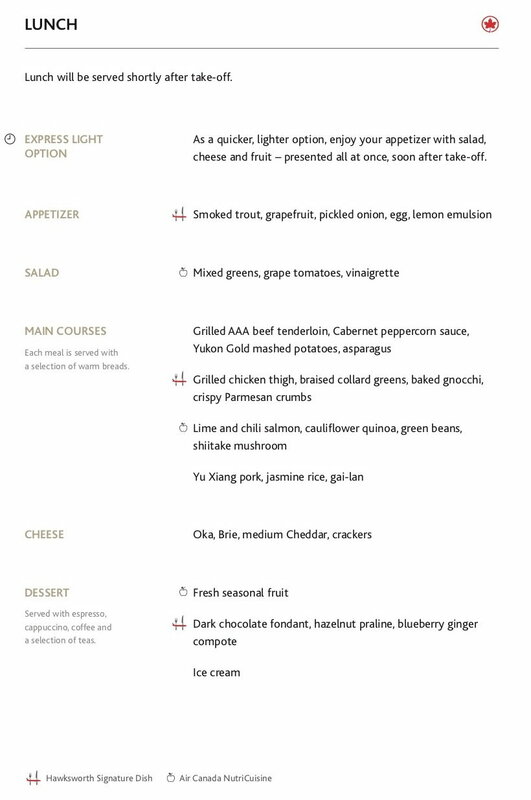 AC YVR-HKG and YVR-TPE, yet no menus at all for AC 18 or AC 8. I also suggested a while back AC take a look at how LH has their menus available. LH FT has a thread too. I recently flew YYZ to GRU in J. To my surprise this is now "express service" meaning no appetizer, no drinks until meal delivery. This was in both directions. I do not appreciate this at all. There is always the option for express meal service in J. I like to savor the dining experience, not having it all thrown at me all at once. I also know on "red eye flights" there is no dinner service at all. Only breakfast. 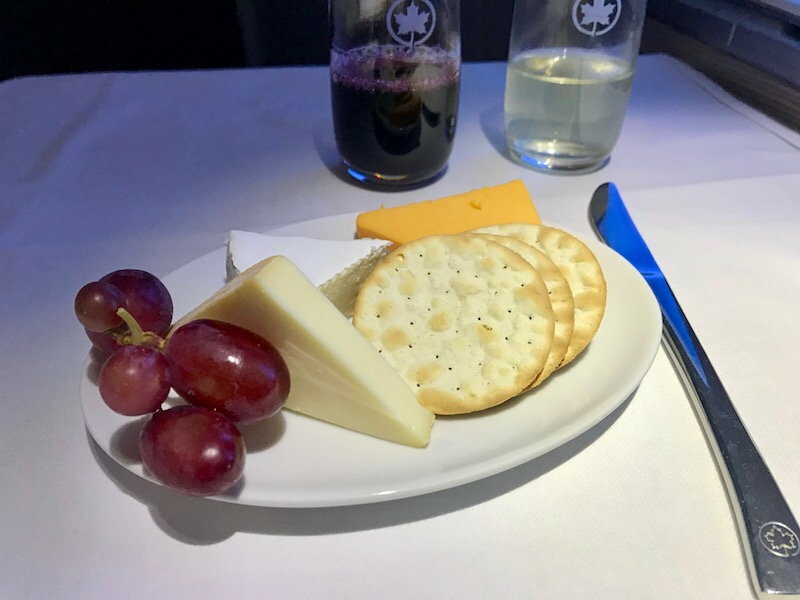 I discovered this the hard way on a YVR YYZ flight when I was expecting a dinner meal. Only peanuts available. I consider these "AC enhancements" to be downgraded service. I still cannot get them for AC1/2 which I have six legs booked on between the two routes. Any idea if it's shared with another? I would think it should have some unique Japanese items. I can pull menus for AC739/756 though. I didn't think to even try after checking AC1 failed, so thank you for the heads up. This has been around for a while I think? It started on TCON flights. Eastbound red eye flights departing after 10pm or so gets breakfast instead of dinner. Then it expanded to late night TATL, excluding DXB/DEL/BOM. I am not sure when it expanded to long haul flights like GRU. Are they downgrading on DXB/DEL flights as well? If so, huge downgrade. Some background info here. After extensive surveys, audits and type-trials, extra-late departures have transitioned to an Express Late Supper based on Customer feedback. Particularly on YVR-SYD, a late midnight departure, the overwhelming preference was for a quick all-inclusive dinner and sleep. Pre-change, it was not uncommon on late departures to have in excess of 50% + waste, nor did it make sense to be offering the full meal deal until 0200 as Customers were nodding off. 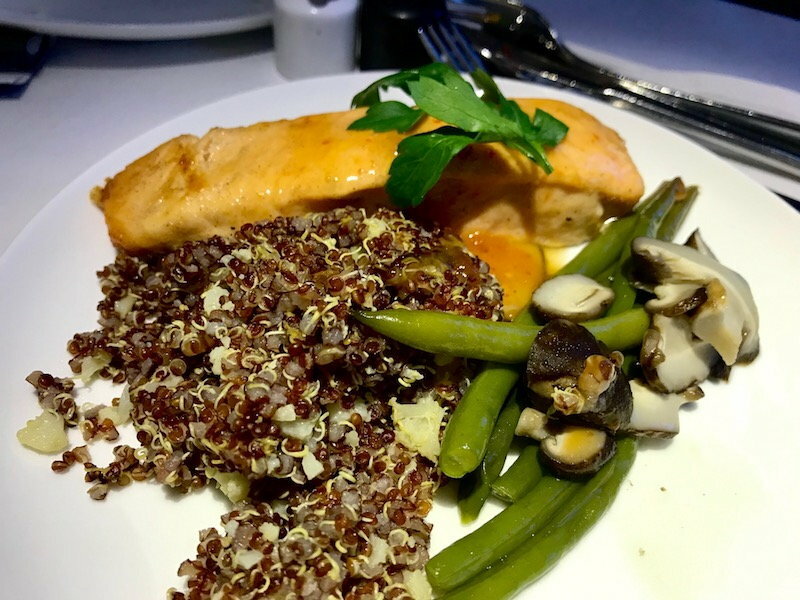 Breakfast orders are not generally taken for the second meal service on ULH flights, as again, Customers are in sleep mode, however FF Status is observed when offering the entrees. This reminds me that I was pleasantly surprised to get dinner service on AC788 LAX-SFO back in September, which leaves at 10:15pm. Given that I always get breakfast on AC754 SFO-YYZ which leaves about half an hour later I wasn't expecting it. I wonder exactly how they decide the cutoff for it. According to @ACYYZ/SD last year, it applies to departures starting at 21:30. Express Supper Service applies to departures 2130 and beyond. Standards vary Domestic vs International. With one notable exception for the Winter Schedule. 836 to MAD has split departure times. 22:05 on Tu/Th & 20:00 on Su. 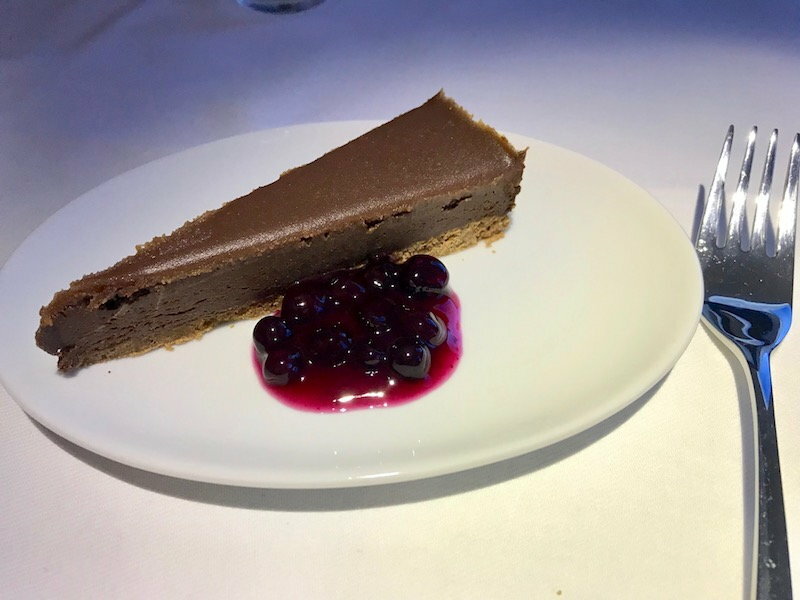 For product consistency and an exceptionally high demand for Express Meals on this route due to short-ish flying time - Late Night (Hot) Express Dinner is served on all 3 weekly flights. Ahh, makes sense now. Thank you for such a quick response!